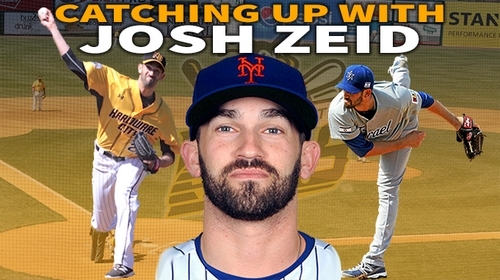 New Haven native Josh Zeid started the 2016 season with the New Britain Bees, and spent the first two months of the season blowing away the Atlantic League with a 97 mile-per hour fastball. 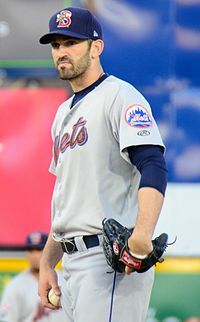 His hot start (43 strikeouts in 37.1 innings), live arm, and MLB pedigree caught the attention of the New York Mets, who purchased his contract from the Bees on June 8th, and he spent the rest of the season pitching for the Binghamton Mets (AA – now the Binghamton Rumble Ponies) and Las Vegas 51s (AAA). After the MiLB regular season ended, Zeid reported to Team Israel for the World Baseball Classic qualifier in Brooklyn, tossing 6.2 innings and striking out 9 to help the Israelis qualify for the 2017 World Baseball Classic. Bees broadcaster Chris Knoblock spoke to Zeid by phone earlier this week about the Bees, the Mets, and what’s next for the former Houston Astros reliever. CK: After your contract was purchased by the Mets…what happened? ZEID: That’s the reason why everyone on the team played in New Britain. That was everyone’s main goal, was to get back to affiliated ball for the last time or the first time. Getting the opportunity to play in New Britain gave me the opportunity to play with the New York Mets and affiliated baseball. Getting back in was really nice. The competition isn’t much different. Getting to play in the Atlantic League really sets you up to seamlessly transition back to affiliated baseball. I played in Double A for a couple weeks, got called up to Triple A and didn’t pitch so well, got sent back down and pitched much better, got called back up and finished strong. It was a long year, lots of traveling…but I’m thankful for the opportunity in New Britain. Playing in New Britain gave me the ability to keep playing. CK: The big news is that you’ll be representing Israel in the World Baseball Classic. Talk a little about the qualifiers, your recent trip to Israel, and what comes next. ZEID: The qualifiers were an incredible experience. I played with Team Israel before, in 2012, and we lost our qualifier, and getting the opportunity to represent Israel in 2016 was pretty much a goal of mine – and especially to have as big of an impact on the team this go around, pitching two games and almost seven innings was…(laughs) not gonna say a dream come true, but very rewarding and redeeming. It was great. Now we get to go to Korea in March and play against some of the best players in the world – not just America, but the whole world. That’ll be super fun. Also, playing for team Israel allowed the opportunity to travel to Israel for the first time in our lives. The fact that baseball led us to visiting Israel is pretty incredible. To get to see things that you’ve only read about and dreamt about is pretty incredible. CK: What was your favorite part of the trip? ZEID: There were so many big things that were so incredible, but …going to the Dead Sea, going to Masada, which is a mountain right next to the Dead Sea where one of the greatest self sacrifices took place – it’s just a pretty emotional experience. Going to the Western Wall in Jerusalem – we just had a great time, shopping in all the markets, and interacting with everyone, it was just a great time. It’s a must-do trip. CK: Apart for the WBC and your trip, what else have you done this offseason? ZEID: This offseason I took a class at Tulane, getting back into the swing of college. I’ve got a few hours I need to finish so I can graduate and I’m making sure that’s going a little faster. I’m eating pretty well, helping take care of [my] son – enjoying the time I get to spend with him ‘cus obviously during the season you don’t get to spend much time. I’m staying in shape for the World Baseball Classic. I’m giving lessons and coaching kids age 6 and up – teaching them what I love best! I really enjoy that. CK: For a New Haven native such as yourself, someone who knew of professional baseball here in New Britain when you were growing up, what was it like playing in New Britain and in the Atlantic League? ZEID: I never thought I would get to live at my own house and play professional baseball, which I did for the first time after playing professionally for 9 years. I got to live at home and gave that a go – it was a very interesting experience. Playing in New Britain and playing in the Atlantic League and playing against former major leaguers and former guys in AAA and international baseball – like I said before, the competition is no joke. You’re playing against guys trying to get back to affiliated baseball, and they’re giving it every ounce of effort they have. They don’t have any ulterior motives – they want to get back to affiliated baseball, and some guys are out there having fun. Those two kinds of people are scary to play against – those guys give you the best effort. You get into affiliated baseball and some of the guys are just going through the motions and doing it because they have to. It’s a really challenging league. CK: So, after the WBC, what’s next for Josh Zeid? ZEID: I’m not really sure. I had a pretty decent year last year, made a lot of improvements and adjustments, and finished the year extremely long, then going into the World Baseball Classic even stronger. Because I’m getting older, and I’ve been with so many teams that it’s limiting the teams I can go to next, so – I’m going to play in the World Baseball Classic, really enjoy my time there, and if it goes well and it leads to something beyond, then I’ll go with that. If not, if the WBC goes well anyways and I don’t get an opportunity beyond that, then I’ll go back to college, finish up college, move on with my life and see what’s next. You can catch Josh Zeid and Team Israel in the World Baseball Classic starting on Monday, March 6th as they take on South Korea at 5 AM EST.